Home » Slider » Redemption! Every boxer has a backstory, the exposition as to why he entered the sport. Showing an appreciation for every fighter who has stepped into the ring, Alan Swyer’s new documentary, El Boxeo, utilizes numerous voices of boxers, trainers, journalists, historians, and promoters, to not only tell their stories in each individual round, but also to pay homage to a sport that elevated some and destroyed others. Despite the insight from the more notable fighters, it is the collective voice of everyone involved that reveals the true essence and establishes the emotional core of the sport throughout the film. Whether it is the sorrow of hearing Puerto Rican stylist Ivan Calderon lament about growing up in a foster home, or welterweight contender Victor Ortiz discussing the absence of his parents or former lightweight champ Rodolfo “El Gato” Gonzalez revealing, “It felt so bad to see my mother and father not being able to eat a meal,” each vignette provided depth to the film. Yet, it was the lighter moments that injected life into the nearly two-our documentary. 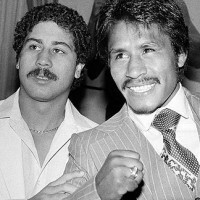 Fueled by the energy of Ray “Boom Boom” Mancini, who excitedly talks about Latin fighters and their salsa dancing prowess, the director also brings the audience ringside with Argentina’s Sergio Martinez, who chronicles the Argentinian style and the gifts of Carlos Monzon. Even Sugar Ray Leonard gets into the act when he characterizes the style of the Cuban fighter as “muy bonito.” As with most conversations on the best Latin fighter of all time, the topic reverts back to Duran, when, in one of the film’s high points, Puerto Rico’s Paco Valcarcel tells an unforgettable story involving Roberto Duran and Fidel Castro. Even more intriguing than revisiting some of the footage and interviews with the Latin legends was the political discussion that defined Cuba Round Seven. Old footage of Che Guevera and Castro was intricately woven into this round, as interview subjects discussed the Cuban greats such as Teofilo Stevenson, Jose “Mantequilla” Napoles, Kid Chocolate, and Sugar Ramos as well as the impact of the Cold War on the sport and various elements of the Cuban amateur program. Debates raged on regarding Ali and Stevenson, and the success of the Cuban fighters who have defected over the years. In a later round, the discussion turned to the possibility of a Latin heavyweight champion. No matter where a Latin fighter hails from, there is something uniquely different and beautiful about each one – the way he carries himself, the ring movements, the power, the courage, and the compassion that he shows for his opponents. We, as fight fans, are drawn to them. It was, and is, simple. Most of the men featured in the film didn’t love the sport, but they embraced it because they had to. But maybe the underlying point of the film that Swyer wanted to convey was that beneath it all, those Latin fighters made us love them and the sport. And after one hour and forty-seven minutes of going back to the glory days, that’s all that really matters. Hits: “Obviously they had a great product to work with” – Oscar De La Hoya referring to himself and how he was marketed. For many athletes, the charm and magic that defines them rarely transcends beyond the playing field. For the late Alexis Arguello, everything that made him authentic and irreplaceable stemmed from the manner in which he treated all people away from the ring. There was no pretense. And he didn’t. Arguello fought for people who had nothing. That passion is sorely missed. Alexis Arguello would have turned 62 today. To this day nearly five years since his death, Arguello’s legacy will continue to live on in the thousands of lives he touched.